After I did the 90's version of the Deora I decided that Bill Golden needed an updated LWR, and I also had another "$3 couldn't pass it up closeout bargain Lindburg Dodge Caravan." 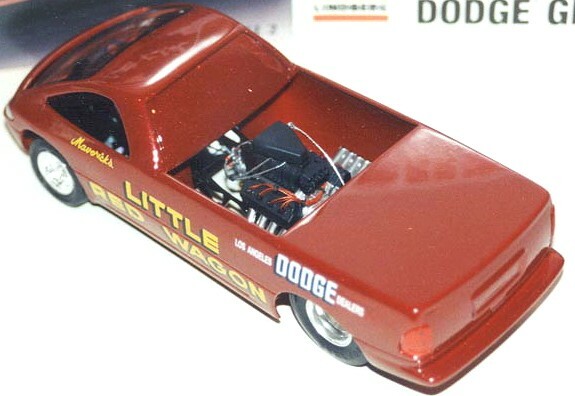 This buildup was done semi-following the Deora design until it came to the chassis and powerplant which was donated by a Revell T/F Dragster. 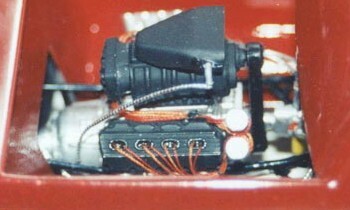 The chassis was cut in half with only the rear half being used. I then had to slice and dice what was left over to make it fit dimensionally due to the expected location of the rear end, engine and drivers compartment, and then added a scratch-built front axle. The chrome on the bug catcher, blower, and valve covers was horrible so I painted them flat black to simulate annodizing. The paint is Testors Cherry Red with an overcoat of Testors Ruby Red Metallic and a top coat of Testors High Gloss Clear all coming as usual from shorty spray bombs.